By air, sea or land, sportists consider Malaga an inevitable place thanks to its exceptional climate conditions. Due to this envied climate, you can practise uncountable possibilities of sports during all the year. The Mediterranean Sea and its warm waters leave place in its landscape for the sport or leisure sails that each day leave place any of the most important marinas in the province, like Puerto Marina and Puerto Banús. The sea is also decorated with sails that are used in more dangerous activities such us windsurf or the original kitesurf. The deep sea preserves beautiful paysages unknown for all the people that have never dive. That is the magic of diving. But let’s talk about the sails… because Malaga is decorated with colored sails but not only in the sea but also in the sky. If you raise your eyes, even in the city of Malaga, it would be possible to see between the clouds some sails of a motor flying lover. 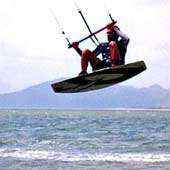 We also can see hang gliding and paragliding in the open air. If we descend to the land, we can take advantage of the orography of this lands practising trekking in one of the great routes located in this area and for the rashest people, it also exists the possibility of climbing. However, if we should mention the most practised activity in the Costa del Sol, this would be the golf with a total of 42 golf courses available for the visitants. However, this is not all, because in Malaga you can have more choices: horses, tennis, paddle or swimming among others. We even can offer you a rare sport: Mushing, which is some like the toboggan on the snow but this time on the ground. So, this is our passion for the sport and certainly, this is a land with a lot of vitality.